One of the best things about being DC wedding photographers is witnessing the blooming of the city’s cherry blossom trees. Having the opportunity to take pictures of fiancés and newlyweds nestled beneath their branches is also pretty nice! Every spring, Washington’s streets and parks come alive as the cherry blossom trees turn brilliant whites or delicate pinks. The area surrounding the Tidal Basin between the Jefferson Memorial and Franklin Delano Roosevelt Memorial is a particularly beautiful spot. Like we said, the cherry blossoms make early spring a great time to be a Washington, DC, wedding photographer. Lots of brides and grooms schedule their weddings or engagement photo sessions when the trees are in bloom. The National Cherry Blossom Festival in Washington, DC is a major draw for tourists coming to the Nation’s Capital. It also attracts a lot of fiancés looking for epic couples portraits to commemorate their wedding or engagement! Because the cherry blossoms are such an important part of Washington’s history, we long assumed that it was one of the few metro areas graced with these lovely trees. We knew that they are the national flower of Japan, of course. That country gifted the cherry blossoms to Washington, DC. We were unaware, though, of how common they are in other places. We were surprised, for example, to find cherry blossom trees blooming in the spring in Hannover, Germany. Similarly, we were delighted to find the white and pink flowers blooming near St. Louis during a recent trip to photograph a wedding there. The cherry blossom trees in question were growing on the Edwardsville campus of Southern Illinois University. That institution of higher learning is located about 20 miles from downtown St. Louis. The couple whose nuptials we were capturing on film had tied the knot near to where their families lived. That was at the St. Rose Catholic Church, about 30 miles farther into Illinois. After exchanging their vows, the newlyweds boarded a party bus with their bridesmaids and groomsmen. The entire wedding party then drove to the university for some posed pictures. 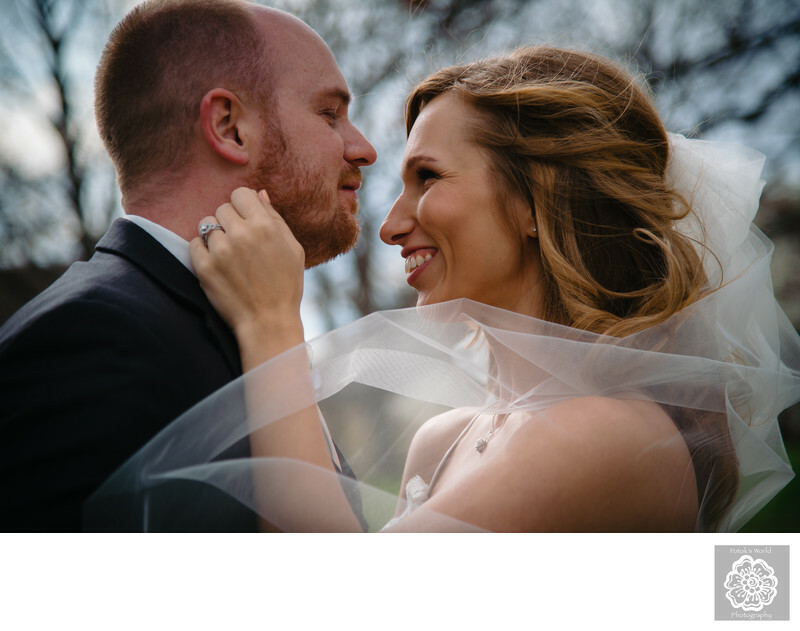 The newlyweds had first met in Edwardsville. They therefore wanted the university to play a role in their wedding and the images that we were capturing. We first took photos of the bridesmaids and groomsmen posing with the newly married couple. Afterwards, we took the new husband and wife away to get some couples portraits. We wanted some photos of them in places that had been part of the beginning of their love story. The best images, according to these DC wedding photographers, were those that we captured beneath the aforementioned cherry blossom trees. They had been planted around a lovely square at the entrance to the campus. In addition to being beautiful, cherry blossoms are also very easy to incorporate into couples portraits. The branches of those trees tend to droop down as they grow away from the trunk of the tree. That creates little cocoons into which newlyweds can be tucked. The distinctive cherry blossoms will then envelope them, creating very visually pleasing surroundings. The delicate flowers frame the couple beautifully as they pose. Location: Southern Illinois University Edwardsville, 1 Hairpin Dr, Edwardsville, IL 62025.